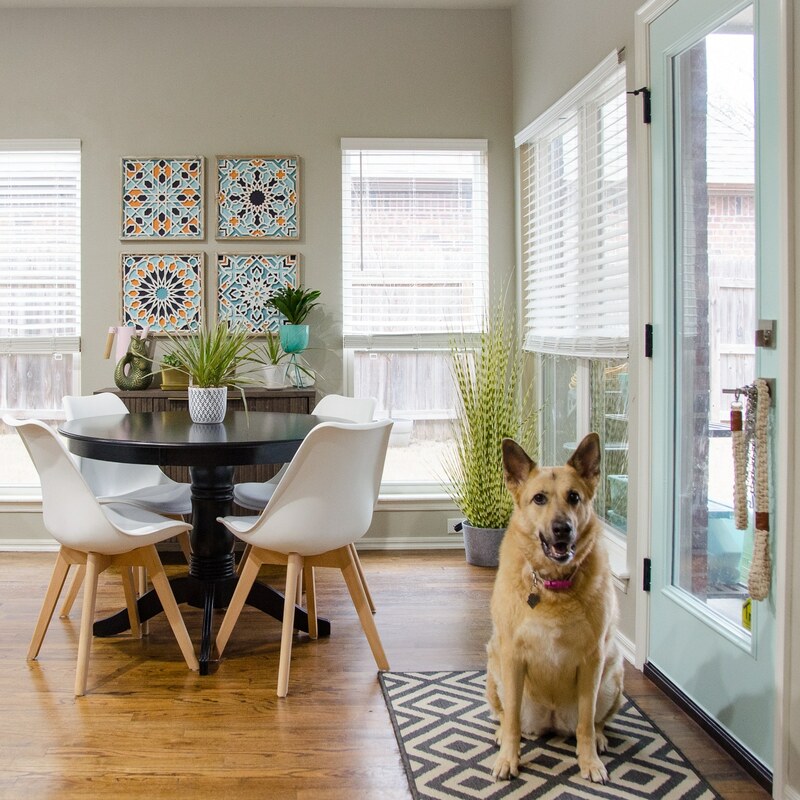 Cheap home decor is something most of us are after, but we don’t want it to look cheap, right? 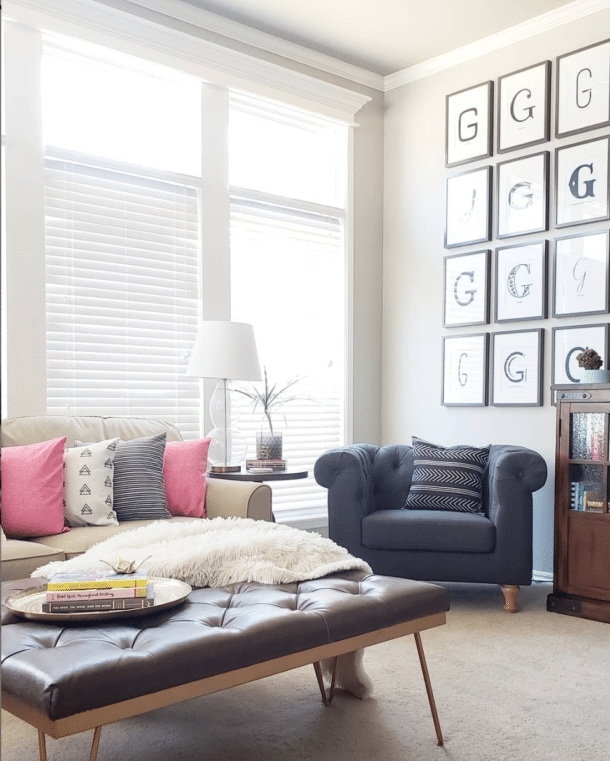 I pulled together my favorite ways to stretch our decorating budget in style! Shopping for decor is one of my favorite things, but the money can get out of control fast. Until I strike oil in the backyard, we’ve had to figure out tons of ways to get the look I want at a price we can actually afford. 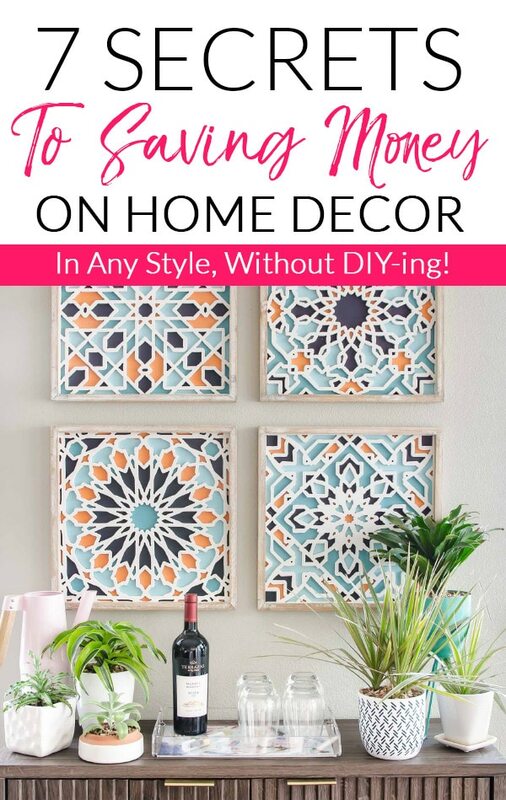 I always try to point out the money saving options within each post, but I thought it would be helpful to pull all my best cheap decorating secrets together in one spot. 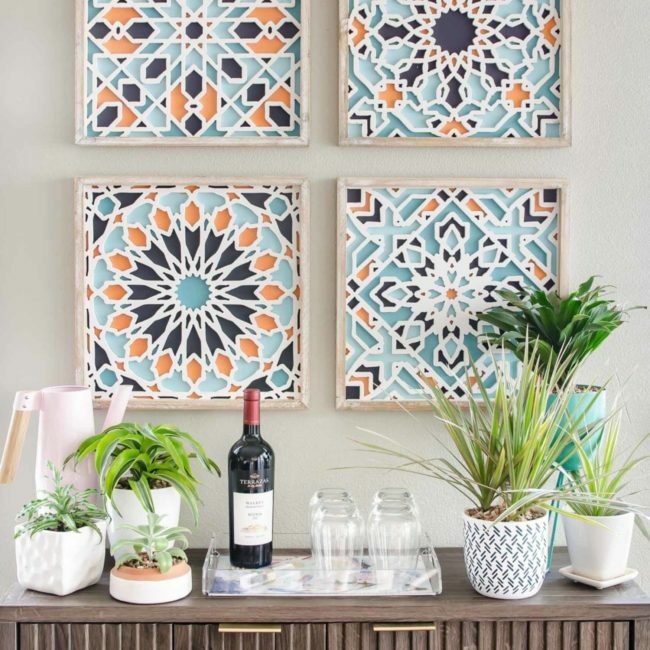 Home Goods, Marshalls, Ross, Old Time Pottery, At Home, and TJ Maxx are some of my favorite sources for affordable unique decor for our home. You could go to all of them one day and walk away with nothing, then two days later the same store will have everything you’ve ever dreamed of. It takes some persistence and you have to act decisively since inventory changes constantly. I’ve also learned that I have to be okay popping into these stores often and also be totally okay walking out empty-handed if nothing matches my current needs. I like to go in with a loose plan of knowing what I’m looking for, be willing to walk out with nothing at all most of the time, and also be open to something unexpected. These cool wooden art pieces were an unexpected find at Old Time Pottery. I think they were $15 each and together make a huge impact. And that tall teal planter was $8 at At Home! The blue and white planter was another great find – only $5 at Marshalls, so it jumped into the cart before I even knew what was happening. You might be shocked to know that Amazon is one of the first spots I look for rugs and furniture deals. The white chairs at our kitchen nook in the above photo were a crazy deal. We paid less for the set of 4 than we could get 1 chic chair most other places. Amazon deosn’t let us put pricing in posts since it changes, but you can see them here (affiliate link). To find the best stuff on Amazon, I usually start with a broad search and find something similar to what I want. Then in the product listing under the description, I look at the section of suggested products based on what other people have purchased. Usually one of those is closer to what I want and I can look at the suggested products on that listing, and keep repeating that process until I find the perfect match for us at the right price. It’s also my favorite place to save money on cabinet/dresser hardware. Holy cow, this one is a no-brainer and I kick myself anytime I forget it. NEVER, EVER EVER buy anything from a retailer without looking up coupons on Google. Seriously, NEVER. I’m not just talking about online transactions either. 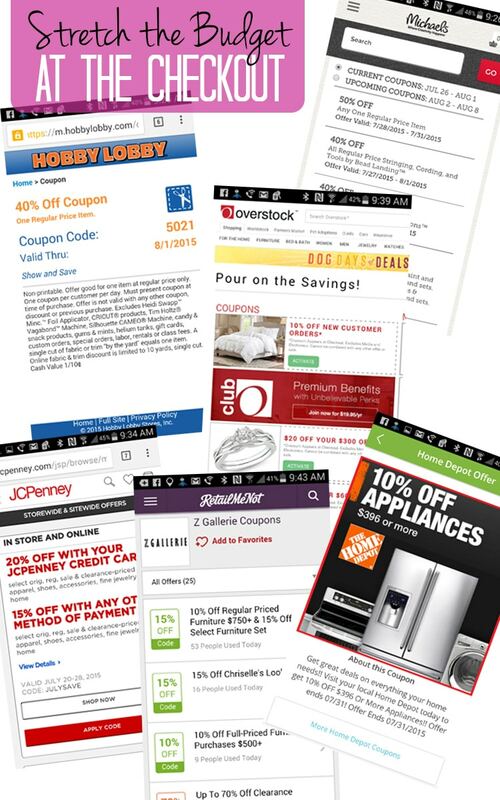 Did you know that most stores take electronic coupons that you can pull up on your phone in seconds? While I’m in line to check out, I’m usually doing a quick Google search for the name of the store and coupon (ex. Hobby Lobby Coupon). It almost always pays off in a big way. 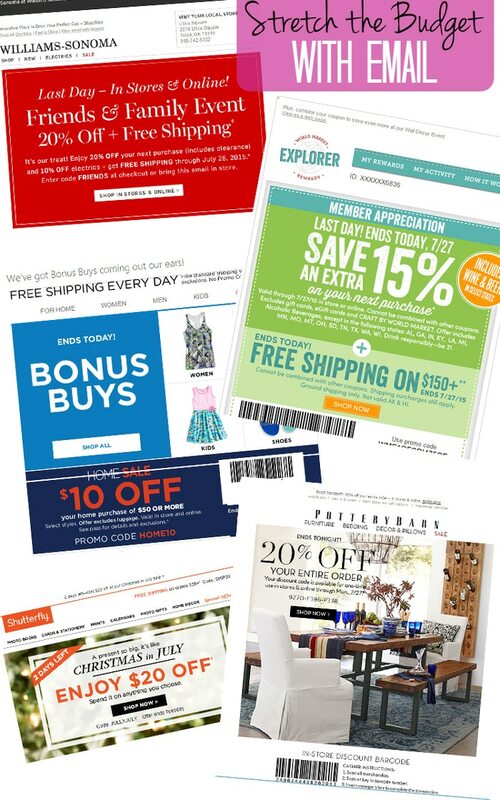 Several retailers have the coupons on their own sites, while you’ll find others on coupon sites like RetailMeNot. Here are a few screenshots I pulled up on my phone as examples. NONE of them required any kind of sign up, they are available instantly! As of today, I have saved $301.75 using the Target app (formerly Cartwheel). It’s super easy to scroll through all the deals on your phone while you’re making your grocery list. OR you can scan the barcode of each item as you put it in the cart to see if there is an offer. The app is getting a bit smarter too. I bought some Dave’s Killer Raisin Bread last week, and this week there is a 20% off offer for it in my cartwheel. It was delicious, so I was already going to buy it again, which makes me even more excited about the discount. That example isn’t decor, but they do seem to rotate through all the decor categories (rugs, bath, furniture, mirrors) regularly. So with a bit of patience in checking each week, you’ll be able to get some exciting deals! Plus, all the money I save on groceries and household items with the app means more money left for something else. I will say there was a glitch recently and it wasn’t giving me the Cartwheel discount IF I had my Red Card linked in the app, so make sure you check your receipts and maybe don’t link your Red Card to be safe. Now I know we all get way too much junk email, but stores really reward customers who are willing to sign up for their mailing list. I figured out the secret of balancing the savings without getting bombarded all day with offers tempting me to buy things I don’t need! I started funneling all my shopping emails to a separate email address. I don’t ever check that account unless I’m shopping and looking for a special deal. I can login and do a quick search to see if the store has sent me any special offers lately. If it’s a store I haven’t shopped at before, I’ll hop online and sign up for their emails. Almost every store will respond fairly quickly with a coupon of some kind for your first purchase with them. Score! I checked my shopping email and found all kinds of savings waiting for me. Just remember, it’s only savings if you were going to buy anyways! If you know what you want, the phone can do more than look up coupon codes! When I was looking for penny tile in the pantry, I knew I needed to buy locally to meet my deadline. But I also knew there was a crazy variety in prices from $4/sq ft to over $10/sq ft. I made the wrong decision and spent an entire day and 1/2 tank of gas driving from tile store to tile store checking prices and availability. Although my quest did make an entertaining blog post, it was a waste of time. Because I knew I wanted 3/4″ white penny tile, I could have spent half an hour on the phone instead. Sometimes I forget to just pick up the phone and call around to find the best deal! So you fall in love with a piece of furniture, but even with the handy dandy coupon you found, it’s beyond your budget. Wipe away those tears and go talk to your new best friend…a sales rep from the store. Because you know what, they KNOW STUFF. Like if that killer couch is going to be on sale next week…or if they are getting ready to switch out lines and your dream piece has a chance at becoming a clearance floor model. Your success rate will vary depending on the individual store and employee, but when you are kind and genuine, it goes a long way. Occasionally, you can actually haggle with retailers, even big chains. It never hurts to ask for things like free delivery! You can also ask questions like “Is this your best price for this piece?” when you are buying more expensive items like furniture. Don’t go haggle over a light bulb at Target, but seriously, NICELY ask the appliance guy at Lowe’s and you might be surprised with the response. Those are all my favorite ways to save. Now I’d love to hear yours! 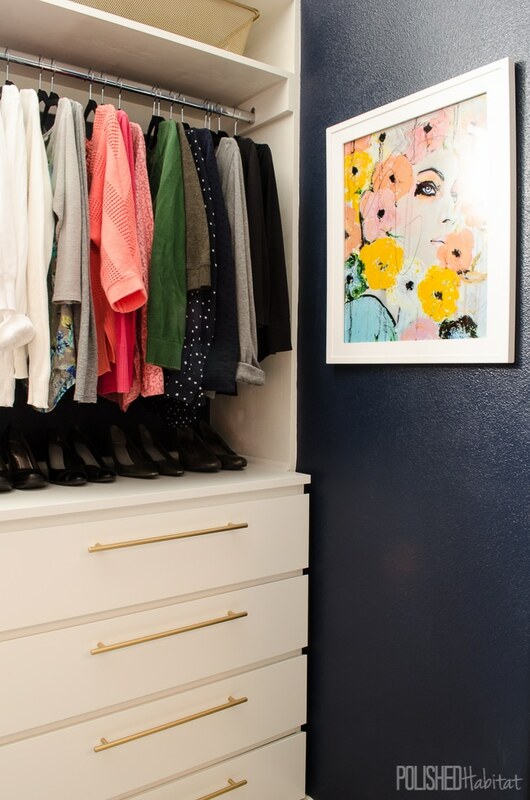 To see how these tips play out in a full room update, check out all the ways we saved money during our closet makeover! I recently needed to buy new towels for our master bedroom. Well, need isn’t the word…I wanted a new color. I found the towels at JCP but they weren’t on sale. I stalked them for a few weeks and woohoo! they popped up 50% off. It was worth the wait. Totally!!!! I wanted to have a bullet about being patient just like that, but it didn’t work with the instant savings theme. But waiting for the sale is so worth it when it let’s you grab some of the “want” items! These are all great tips! Finding coupons on my phone while standing in line is the new norm for me. I LOVE the idea of signing up with retailers at a separate account, that is such a GREAT idea! Yeah! So glad there was still something helpful in the post for someone who’s already on top of saving money at the checkout! These are all awesome tips,a nd I am really enjoying this series!! I wanted to add a small tip, with regard to your tip on signing up for retailer e-mails… If you have a gmail email address, they have the tabbed organization tool now. For instance I have 4 tabs on mine (I dont know if this is standard, or if it can be expanded?) but anyway I have a Primary tab, where all of my new ‘important’ emails go, and an Update tab, which usually gets replies to previous business, etc. a Social tab which gets all of my blog emails whenever my fav bloggers have new posts, and then…FINALLY, my Promotions tab gets all of my retailer emails with coupons, sales advertising etc…. Gmail usually does a good job of figuring out where to put everything, but if you don’t like where any of your e-mails are showing up, just drag one of them to a different tab, and it asks you if you want all future emails from that person/company/blogger to go to the new tab, and you say YES and it is a done deal .. now all of my coupon emails are in one convenient spot. Worlds longest comment – but I thought it was worth mentioning. thanks for all of these awesome money saving tips!!! Totally worth mentioning! Thanks for sharing and I’m so glad you are loving the series! Great tips, Melissa! I signed up for Honey which automatically looks for coupon codes when you’re on the checkout page of a site. Even better: On Amazon, they’ll check to see if another Amazon seller has it for less, and you can click on it to put the less expensive item into your cart instead of the original. I can’t even imagine how much I’ve saved on Amazon alone!! Oh that’s a great tip too! Thank you! Jackpots are also waiting at Goodwill and other thrift stores! 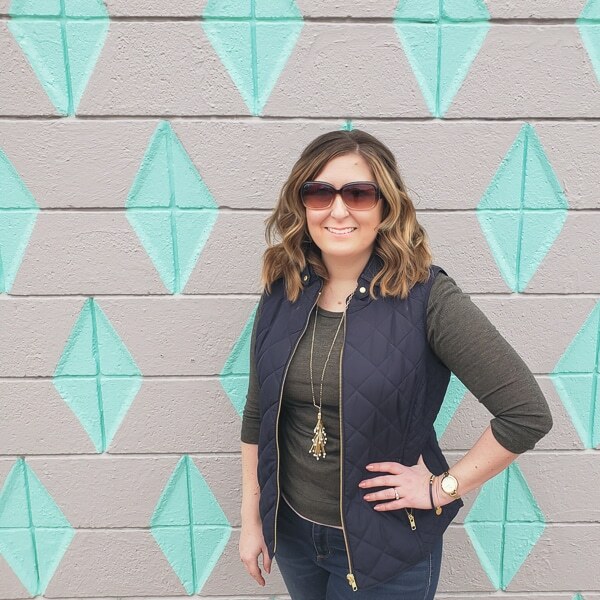 I have almost totally decorated our home with finds there and you would never know it….it’s amazing what people get rid of, out of boredom or changing tastes….everything is classy, needed no DIY-ing, and was expensive at one time, but not at Goodwill! Like the other stores you mentioned (the TJMaxx clearance aisle is my second home!! ), you have to go often and be okay without buying anything. There is nothing quite like the thrill of the hunt, and the joy of success when you are serious about saving money while making your home beautiful! Yes! That’s a great tip too and a great point that it’s very similar in that you have to go frequently. I’ve got a few more tips for a follow-up post and that will definitely be included! Ahh so many bright colors I love it . If Amazon has something, you almost can’t beat it. Amazing, isn’t it? I did buy a bed at Overstock once, and it came with some flaws; and also with the hassle of not easily returning it. That was a learning experience — I am now careful when buying big heavy stuff or furniture online. But I bought some bookshelves successfully at Target after that, verifying that I could return them to the store if needed. Can’t beat shipping for free on top of a sale price when you can score that! Anyway, when I do come to an understanding of what I want in my home, I am a DIY’er, just can’t help myself. I have noticed it runs in the family. For most categories, I get ideas from Pinterest and blogs, go to Instructables.com to see if someone has made something similar, and look for tutorials on the techniques involved. It’s more fun for me, and a good thing to accumulate skills and experience. For furniture, especially if I can wait, I also watch Craigslist. Sometimes the right item comes along. I visit the local furniture stores, but shop as carefully there as with used. I’d like to visit the larger flea markets, and wish we had more in our area — I do like that Fleamarket Flip program, though they make it look so easy, all in a day! Lol. Melissa, do tell us what you think: Which categories of home decor are worth taking the time to DIY? Do you have any guidelines for yourself? I totally agree that sometimes it makes more sense to DIY and sometimes it makes more sense to buy! I have a dream to make a flowchart for you guys on exactly that topic, but I keep forgetting about it. Writing it down right now! Anyways, the biggest 3 things I consider are the material cost for DIYing vs to the cost to buy, the time it would take to DIY, and the timeline (the weeks before Christmas, I’m all about buying vs if I’m not in a rush, I can wait for the perfect thrift store/Craigslist find to makeover). But then all those are balanced against my mood and if I’m looking forward to a project or if I want to learn something new. It would have been more cost-effective to just buy my parents a new outdoor bench, but I wanted to try stripping the paint, so I tackled it as a DIY. Thanks for the tips! Can I ask how you like the quality and sturdiness of those chairs from Amazon? Do you use them every day? Sure! We don’t use them daily because we end up eating at the island, but they got heavy use over the holidays with both kids and larger adults with no problems. So far, we haven’t had to retighten any of the bases or had any issues. But, it’s only been about 4 months so I don’t have a solid long-term answer for you. You are totally speaking my language. I’m the worst at taking a deep breath and waiting for something to go on sale, but these are great tips to cure the shopping itch while still saving some money. Thanks for taking the time to share! Glad it was helpful Christin!